The .25 ACP (Automatic Colt Pistol) (6.35×16mmSR) is a semi-rimmed, straight-walled centerfire pistol cartridge introduced by John Browning in 1905 alongside the Fabrique Nationale M1905 pistol. The cartridge was designed by John Browning for early blowback pistols that lacked a breech locking mechanism. 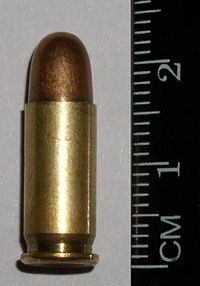 The cartridge was designed to duplicate the performance of a .22 Long Rifle cartridge, when fired from a two-inch barrel. The .25 caliber was the smallest case Browning could use that still had space for a primer pocket. The greased, coated lead bullet design, standard for the .22 long rifle of the day, was replaced with a copper jacketed round nose profile for more reliable feeding in self-loading pistols. The bullet weight was typically 50 grains, keeping with the sectional density of the 40 grain .22 caliber bullet. The cartridge is of semi-rimmed design meaning that the rim protrudes slightly beyond the diameter of the base of the cartridge so the cartridge can headspace on the rim. A recessed extractor groove allows an extractor to grab the cartridge reliably. It is one of the smallest centerfire pistol rounds in production, and is commonly chambered in small, so-called "vest pocket" pistols. The .25 ACP achieved widespread use after Colt introduced the Browning-designed Fabrique 1905 vest pocket (sometimes referred to as 1906) to the United States as the Colt Model 1908 Vest Pocket. Though the .25 ACP was designed for semi-automatic pistols, various .25 ACP revolvers were produced in the early twentieth century by Belgian, French, and German gunmakers such as Adolph Frank and Decker. In the late twentieth century, Bowen Classic Arms produced a custom Smith & Wesson revolver in .25 ACP. Following World War II, the Italian Lercker machine pistol was chambered for the .25 ACP, but achieved little distribution. The use of the .25 ACP allows for a very compact lightweight gun, but the cartridge is relatively short ranged and low powered, putting it in the same class as the .22 LR rimfire cartridge but at a significantly higher cost. Although the .22 LR is slightly more powerful when fired from longer rifle barrels, the .25 ACP is viewed by some as a better choice for personal defense handguns due to its centerfire-case design, which is inherently more reliable than a rimfire cartridge. Manufacturers have loaded commercial hollow-point bullets to higher velocities than standard 50-grain (3.2 g) full metal jacketed loads. Firearms chambered for the .25 ACP cartridge run the gamut from inexpensive, simply made guns like the Raven MP-25 and Jennings J-25 to higher quality and relatively expensive guns like the Baby Browning, Walther TPH, and Beretta 950 Jetfire. The tiny cartridge has also been used in some precision crafted target pistols. 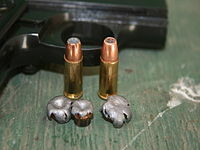 Modern jacketed hollow point loads for the 6.35mm/.25 cal. Bauer .25 Auto pocket pistol. ^ *Wilson, R. K. Textbook of Automatic Pistols. Plantersville, SC: Small Arms Technical Publishing Company, 1943. p. 258. ISBN 978-0-935632-89-7. ^ Hogg, Ian; Walter, John (2004-08-29). Pistols of the World. David & Charles. ISBN 0873494601. ^ Bowen, Hamilton. The Custom Revolver. Privately printed, 2001. ISBN 978-0-9713366-0-5. Wikimedia Commons has media related to .25 ACP. Ballistics By The Inch .25ACP results. This page was last edited on 5 February 2019, at 02:38 (UTC).